Author rohitPosted on September 16, 2013 September 24, 2013 Categories Startups9 Comments on So you want to join an accelerator? There is much excitement, rightly so, about all things mobile. Mobile to me means native mobile. Not mobile-first, not mobile-focused, not mobile-optimized, but an experience you deliver that cannot be delivered in any other medium. iPhone and later Android drove the initial cracks and now the tectonic shift is splitting apart the pangaea in to new continents. Instagram was the first exciting mobile company that wasn’t just an app – such a shame they sold out early before they threatened other social platforms. SnapChat is immensely exciting because it is a new and mobile-only behavior and experience. Uber is fast becoming the very definition of importance of delivering a unique experience – on mobile – and eliminating all other friction (Phone calls, reservations, card entry, opaque delivery,…) from this experience. 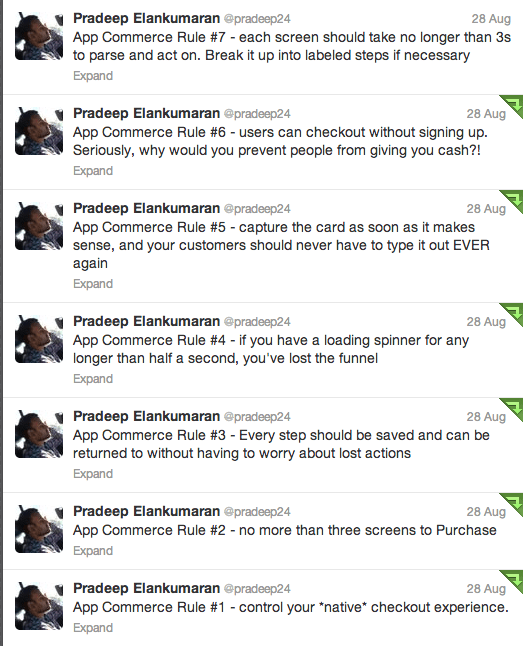 Pradeep Elankumaran, co-founder & CEO of Kicksend, recently tweeted out a series of great rules to think about app-commerce. App-commerce is one of the new mobile segments appearing in this new native mobile landscape resulting from said tectonic shifts. Transactional engines riding on top of fast growth. These kind of innovations in design, experience, growth, and delivery are going to define our brave new mobile world. As for all that’s legacy-web, we’re fast approaching Fahrenheit 451. Author rohitPosted on August 30, 2013 August 30, 2013 Categories StartupsLeave a comment on What does mobile mean to me? no mission. i have no mission. there are some things that feel right and some pursuits that feel wrong but i have no mission. a series of impulsive decisions is how i have described my ‘path’ through education, jobs, and technology to those who’ve asked. there were clearly a number of shaping influences early in my life including technology, literature, and an environment that encouraged curiosity above careers. there were, however, no maps of ambitions longer than the next few years. my world as a school kid was competitive swimming, my click III camera, books across the house, glimpses of life in Boston & Rochester from my father’s photos/slides, stacks of life and aviation week & space technology magazines, and that fantastic blue of early xerox of typed grad school papers and assignments. my thoughts on who i wanted to be went from a journalist to engineer (Civil/Architecture) to communications (EE) in a few years across high school and the first few years of engineering school. and it got easier every year – from the tyranny of linear algebra in first year (42/100 – not my proudest moment) to tensors, electromagnetic theory, and lasers where assignments and exams became trivially easy. still, no ambition – neither money nor fame, or any notions of a career. but i was curious – about everything i did not get to know or do. amount/nature of scholarships was a path to Canada for grad studies, then a sideways arrival in the valley at a time before i knew what a bubble was or startups or venture capital. i passed up two offers of conventional employment with Nortel, a company that was among the top 3 in telecom equipment makers and now doesn’t exist anymore. but i got to do what i wanted to do here and was curious for more. now, after startups, failures, and a good amount of learning, still no mission. this is the downside of impulsive decision making. fortune, timing, and great talent of others around me across all the impulsive decisions i made has propelled me thus far, not a (or my) mission. though not at any cross roads or impending forks in the road, it feels like a more formed set of wandering paths if not a straight road around my curiosity may be better. i honestly don’t know if it would be but it does feel like it could be and like most of my decisions, i feel like impulsively acting on it. In other words, I may be getting old. This is the venture capitalist’s conceit. We often throw up an array of stats, facts, and extrapolations of founder statements in order to coax ourselves out of our quicksand trough of conviction and manufacture courage where there is none to move to a funding decision. Our conceit is not asking founders to bend the future to their will, it is asking them to handcuff that conviction with certainty. Beyond these realizations, we can argue financial projections, models, and hiring plans forever and will not get a shred of certainty. Yet we ask for it…. and more. And most founders partake in this ritual habitual by supplying ‘data’ riding on powerpoint in response. This is the founder’s conceit. This kabuki back and forth produces incremental decisions, incremental innovation, and incremental startups. Condemned to inconsequential creation of moribund value, a change of pockets for some dollars, and more than a flesh wound from time’s arrow. My work with True Ventures’ portfolio companies often involves founder questions around how much ‘structure’ or ‘process’ is right at an early stage in a startup’s life when they are 3-7 people scaling to 15-25 in 12-18 months. My usual response is to query them further on what they think process/structure means to them and their core employees. A key piece of learning in these interactions for me is that most startups, unless exceptionally well-formed as a team with their own rule and cadence, need a little structure and a lot of freedom. The closest analogy to think of exactly how much structure you need is Jazz or Indian classical music. The end product seems like much improvisation but sufficient structure is required to let the right improvisation happen. No structure at all leads to cacophony, too much structure leads to predictable melody with no delight. A little structure to serve as scaffolding for experimentation is the perfect middle. Like a basic 4/4 beat of rock is the right minimum before one experiments with backbeats or 3:2. For (North) Indian music, 4/4/4/4 teen taal is a great start before putting together keherwa or rupak taals or layakari. A little structure and a lot of freedom. This balance of structure and experimentation should occur at every level of a startup’s work. At the engineering/ iterative development level, ‘structure’ is required across dev-environment, tools, tests, dependencies while ‘freedom’ permits developers to push perf limits, latencies, adjacent features, new feature demos. At the product level, ‘structure’ is required to figure out which metrics confirm market-fit, user-testing, pre-proto testing, and ‘freedom’ applies to figuring out new segments, adjacent markets, and new user behaviors. At the managerial/company level, ‘structure’ primarily applies to communications, conflict resolutions, and all matters financial & legal. And ‘freedom’ must reign for pivots, divots, new product discussions, ‘what-if’ hallway/coffee talks, offsites. [divots: a startup’s attempt at product development, early-market testing, and failures that leave a slight hole or rugburn in its resources]. At the margins lives creativity of all kinds and it is in the margins that you must permit near complete freedom of thought, action, and iteration. Between the margins is the required structure, as unglamorous and boring it may be, it is essential to permit freedom.